I wanted to get some trip maps framed with photos as a conversation piece and memorial to the road trips. I still haven’t found a great way to make these maps, but I have found an acceptable way. What I ended up doing was taking the “as planned” routes I had in Google Maps, modifying them to “as driven,” and saving the links. I then used the service Maps to GPX to convert to, yup you guessed it, GPX files. I took those GPX files and loaded them in to GPS Visualizer and exported them as a PNG. Sadly, the largest they’ll allow is 2000px by 2000px, but that appears to be enough to print an 8x12. Rather than relying on the labels in the GPX files, I then loaded the PNG into Photoshop and added them manually. Bold text is for overnight stays, normal for sights. I’m mostly happy with how they turned out, and I must say they look sharp in print. First two rounds are at the framers. I’ll drop off the OAT one when I pick those up. 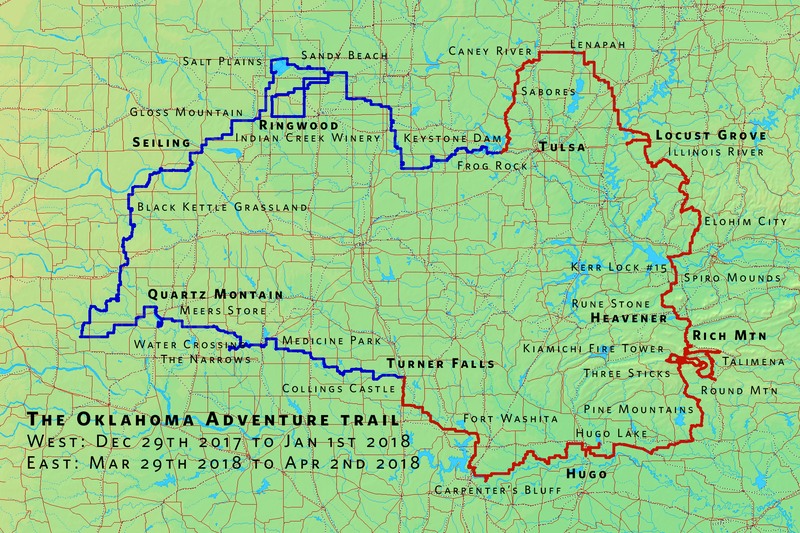 Oklahoma Adventure Trail - Victory!